Vector Architects have designed a simple, contemplative, spiritual space extending into the air above a beach on the Bohai Sea. 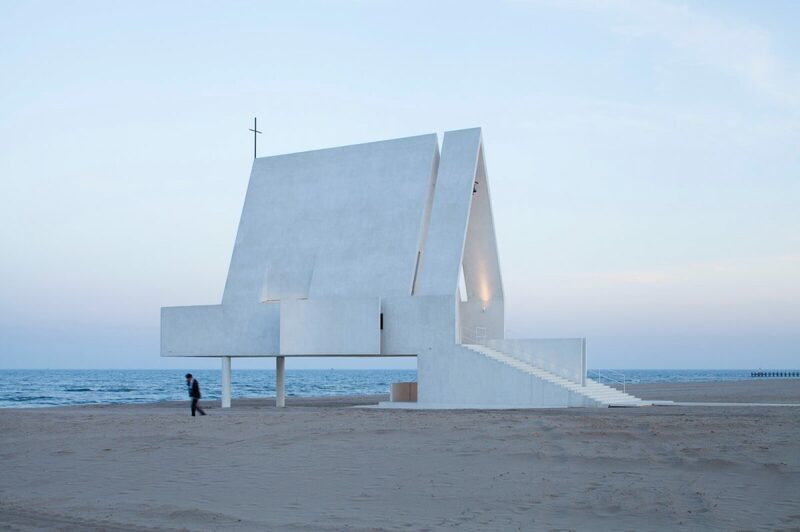 Approached from the shore via a long, thin, concrete path the chapel presents a narrow, elongated profile with it’s steeply pitched roof rising above a flight of stairs. A centrally positioned rectangular aperture opens directly through the entire structure extending one’s view to the horizon beyond. Ascending the stairs to where one may enter through double wooden doors one comes beneath a porch formed by the opening of a vertical slit to separate it from the body of the chapel. This porch is adorned with a single bell on a cross beam just below its apex. Entering one finds a wall crossing most of the width of the chamber with a single central slit offering a view to the simple iron cross at the far end. Rounding the wall one enters the church proper, a simple space of 14m x 7m ending in a rectangular picture window facing directly out to sea. Rows of plain, wooden benches on either side of fer seating for visitors while a lectern set to one side provides a position from which they might be addressed without disrupting their view. Lighting is thoughtfully controlled, with daylight appearing through various openings glazed with stained glass creating subtle plays of colour and shadow as the sun passes overhead. To one side a narrow passage gives entry to a smaller space, once again ending with a view towards the sea, permitting a single visitor to stand alone in contemplation. The inner and outer walls alike are of the same rough white concrete: textured enough to feel weather-worn , refined enough to present the chapel’ s delicate form. Viewed from the sides the bulk of the chapel stands on thin legs seemingly unsupported but for the steps at the landward end. It appears to drift somewhere just above the horizon, at once both of the sea and of the land. Beneath the body of the chapel a space is created where beach goers can gather, rest in the shade or pause to take in the view.